Go! 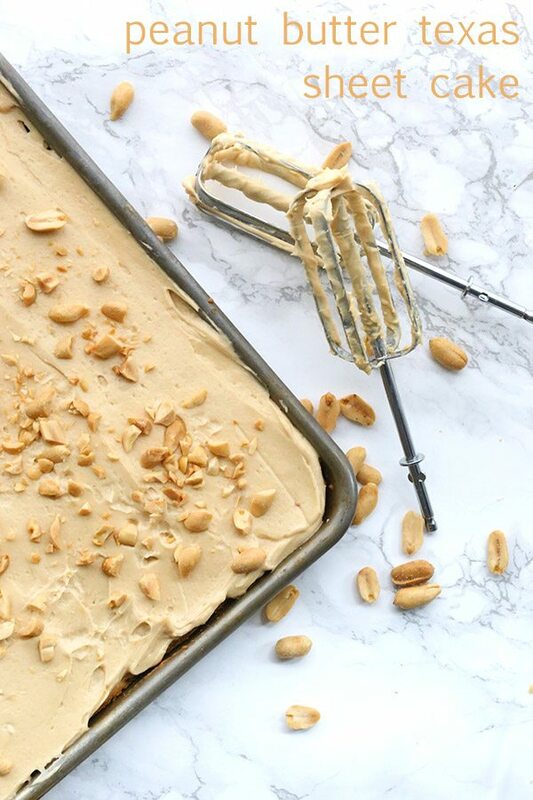 Go to your kitchen right now and make this low carb Peanut Butter Sheet Cake. 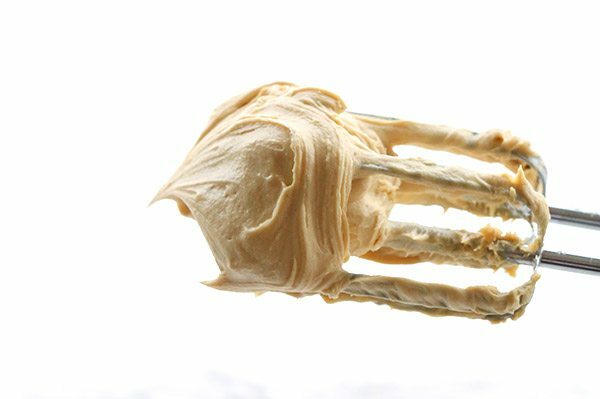 With a creamy layer of sugar-free peanut butter frosting, it’s a peanut lover’s dream keto dessert. I have to confess, I was a Texas Sheet Cake virgin until I met my husband. I guess you can chalk that up to the great cultural divide known as the 49th parallel. He once waxed poetic about his mum’s Texas Sheet Cake and I looked at him with that blank expression that says “I do not understand the words that are coming out of your mouth”. I had to get a full explanation of this well-loved American dessert. And then, of course, I had to get a huge serving of it at the next big family gathering. 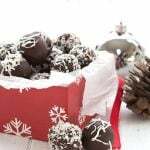 As a lover of anything with chocolate and pecans, it got a huge thumbs up from me. I may or may not have gone back in for seconds. Possibly thirds. There’s a lot to love about a cake like this. It’s easy to make and assemble, because you just frost it and serve it right out of the pan. What might be viewed as a gauche shortcut for other cakes is perfectly acceptable with it comes to Texas Sheet Cake. It’s also easy to feed a crowd with this low, flat cake, as you can get 20 or more servings depending on the size of your pan. But my favourite part about sheet cake is that it has an excellent frosting to cake ratio. No overly thick layers of sponge cake with a paltry thin layer of frosting here. Every bite has the perfect proportions of cake and frosting. I know that I am totally messing with tradition by making a peanut butter version of Texas Sheet Cake. What’s really shocking is that I didn’t add any chocolate whatsoever. You know my deep and abiding love of all things chocolate and peanut butter. I was sorely tempted and the thought of drizzling some chocolate over the top did cross my mind a few times. But I wanted pure, unadulterated peanut butter flavour so I gutted it out and fought my chocolate instincts. I simply garnished the top with some chopped salted peanuts instead. And you will be so glad I did! This may have been the best cake I’ve made in a long time. One little tip: you may want to make this in secrecy when no one is around. Because you won’t want to share the beater-licking duties with anyone else. Mine….all mine! 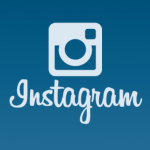 See what I am sharing on Instagram! Go! 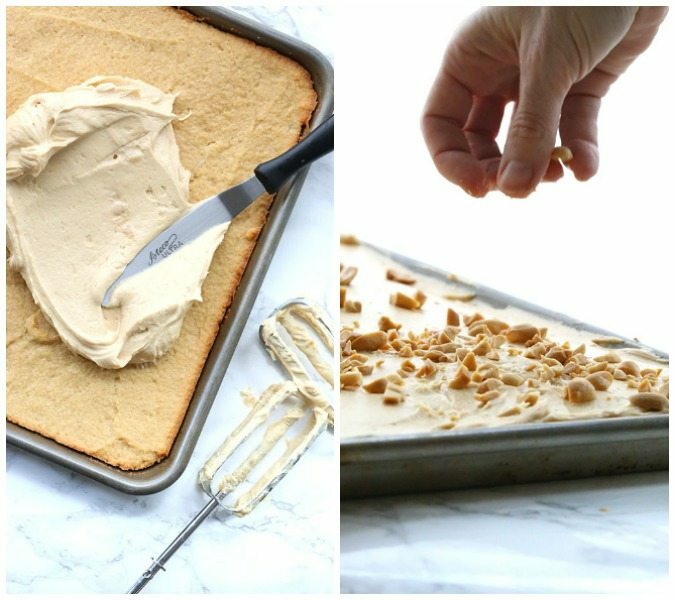 Go to your kitchen right now and make this low carb Peanut Butter Sheet Cake. 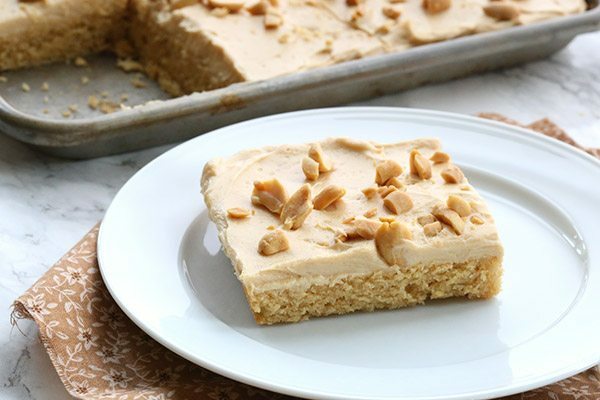 With a cream layer of sugar-free peanut butter frosting, it's a peanut lover's dream dessert. In a large bowl, beat together the peanut butter and butter until well combined. Beat in sweetener, and then beat in eggs and vanilla extract. Add half the almond flour mixture and beat until well combined and then beat in almond milk. Beat in remaining almond flour mixture until well combined. Spread batter in prepared pan and smooth the top. Bake 18 to 22 minutes, until edges are golden brown and cake is set. Remove and let cool in pan. In a large bowl, beat cream cheese, butter and peanut butter until well combined. 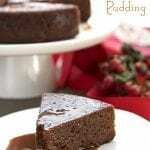 Beat in sweetener, cream and vanilla extract until mixture is smooth. Spread frosting evenly over cooled cake. Sprinkle with chopped peanuts. Serves 20. Each serving has 7.14 g NET CARBS. (It's pretty rich so you can get more like 24 servings out of this, if you cut them a bit smaller). This looks and sounds fabulous – amazing flavor. Wow! I’m at lost for words… Your amazing recipes just keep coming… I’m pretty sure you’ve made this a few times, have you ever tried it with the “chocolate drizzle”?… I’m just curious…lol… Thanks always! Glad you are doing what you – leading the peanut butter cake revolution, and making it healthy! This looks great. But I don’t have a sheet pan. If I made it in a 9×13, should I halve the recipe? Or cook it longer? Or divide it between a 9×13 and a 8×8? AAhhhhhh. Help, please. You don’t have a rimmed cookie sheet of any kind? If not, you can do either just the 9×13 and bake it longer until it’s set (wouldn’t be a sheet cake but would STILL be awesome). Or you could split between the two pans. Could I do this as cupcakes? Sure! They will take about 20 minutes to bake but watch them carefully. There’s also a version of a white Texas sheet cake out there that is to die for. Made with sour cream instead of buttermilk as in the chocolate version. Have you made a low carb version of the chocolate Texas sheet cake? Thanks for all your recipes. Everything I’ve tried has been so good! Oh yes, you were so right! I did go straight to the kitchen and make it. It is divine…so delicious. My husband could not wait until it was completely cooled to try it. Even without frosting it received a great review. Wait until he tastes it with frosting! My sheet pan measures 12″ x 18″, so I decided to use a 10″ x 15″ casserole dish. I baked it 20 minutes and it turned out great. Is a taller piece of cake but sure does not stop us from eating it. Thank you for your wonderful recipes. I just love the title of your blog too as it is so true for me. Keep up the great work. You are a wizard in the kitchen. Thank you again. I cannot wait to try this. The chocolate version was such a fave of mine. Of course, that’s been off limits for years, but I did love it so. 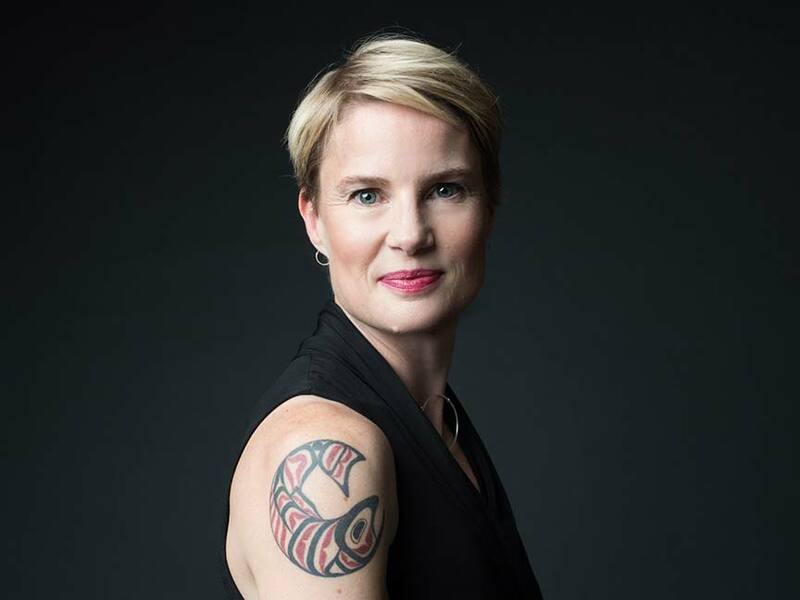 Carolyn, do you have any ideas for how to make a chocolate version LCHF? When you were talking about adding chocolate to the peanut butter, it made me think of a Reece’s cup, which made me wonder about adding cocoa to the PB recipe! 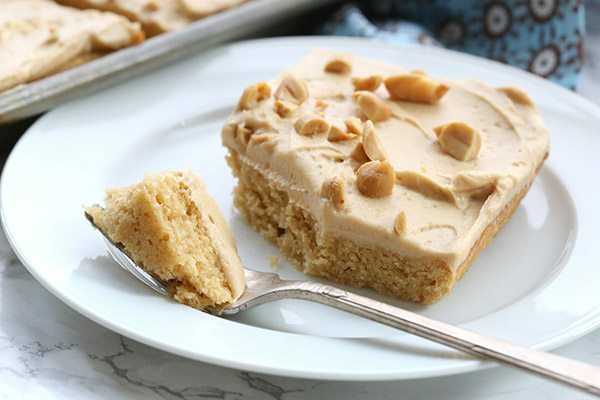 I will be making this PB cake, as written, very soon! Thank you for another masterpiece!! You wouldn’t want to do that in this case because the frosting would become a complete mess. Maybe this will divert me from my obsession with your chocolate peanut butter bars! What would the amour be if I made this with all almond flour? If sound delicious. Thanks for the great recipe. It should. It will be a little difference consistency. Do 3 times the amount of coconut flour. A question on the peanut butter….Do you use sugar free/ pure ground peanuts? There are many choices and some with lots of sugar added. Thank you. Peanut butter AND 20 servings! Wow, thank-you!! This looks and sounds amazing! 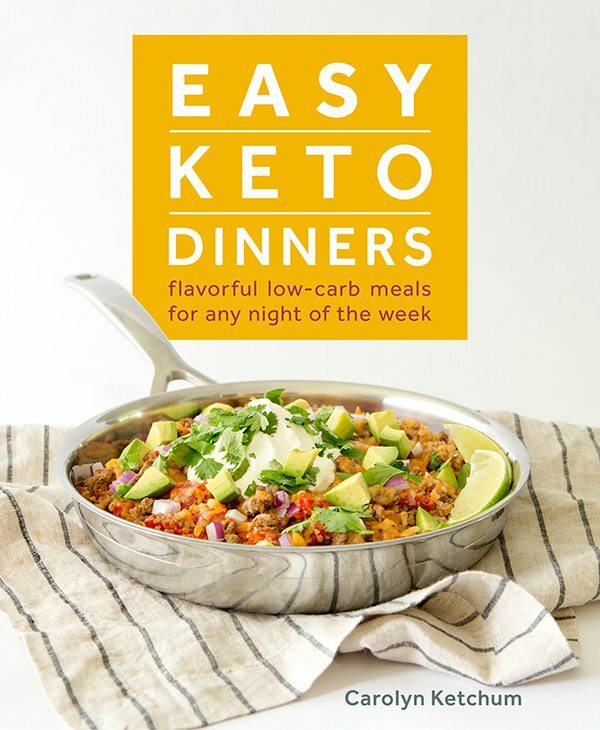 I’ve recently started a low carb lifestyle and I am obsessed with your blog. Thank you! The frosting is really good on its own, hehe. I served it in little cups (still topped with the chopped peanuts). I love anything peanut butter and this looks great! 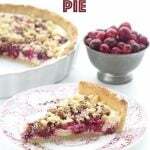 I love the coconut flour + almond flour combo. . I am currently addicted to this! love this sheet cake! I love peanut butter more than the average person 🙂 Love this! This looks amazingly good! I love using almond and coconut flour to bake with! Could i use THM baking blend in place of the flours? Cup for cup? I suspect not because baking blend is much drier. You will more oil and/or liquid. Yup, I’d be licking both the cake batter bowl AND the frosting bowl!! I made this last night and it is delicious. 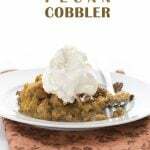 I really think it is one of the best low carb desserts I have made since I started low carbing four years ago. 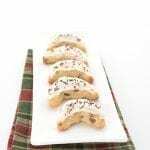 It is very rich and I cut it into 24 pieces and we were very satisfied with that size. Of course, I may or may not have added some chocolate shell and whipped cream to our servings. Lol. Thanks so much for this keeper recipe. What a fabulous looking cake, decadent! Can we sub the THM Baking blend for the almond flour, coconut flour and protein powder? Trying to not use too much almond flour these days. Thanks! Can’t wait to try it! It’s going to be drier so add a bit more oil and/or liquid. Also…may not rise as much if you don’t add the protein powder. Could I use granulated Swerve instead of powdered or do you think it would be too gritty? Very gritty. Can you powder it in a coffee grinder? I put it in my Ninja…….I could officially eat the icing by the spoonful! DELICIOUS! !!! Hi there! Just wanted to tell you that I did use THM Baking Blend (had no almond flour), 2 1/3 cups of blend instead of the 2cups almond + 1/3 cup coconut. I might be hungry, and also deprived of sweets, but I love it! Could also be because I never tried the original and don’t know what I’m missing. Frosting is fantastic! P.S. Got me some almond and coconut flour…I may not be able to handle cause it will REALLY be so good! I know this question was asked, but what brand of peanut butter did you use? Skippy Natural. I just can’t get my family to like the old-fashioned kind so this is our compromise. Carolyn, I love your recipes!! I just have one problem: I can’t buy Swerve in my country, so how can I replace Swerve with Stevia (or another natural sweetener)? Thanks a lot!! 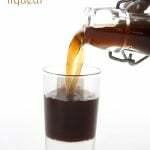 Can you only get stevia or do you have the option of something like erythritol or xylitol? The frosting is best with a bulk sweetener but since it’s cream cheese based, you could probably get away without it if absolutely necessary. Swerve measure like sugar so just figure out how sweet your stevia is compared to sugar and measure it that way. Like you I am still a Texas sheet cake virgin! 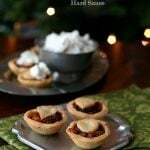 Not tried one and knew nothing about them before this post! Sure looks good though : )) Pinned! Made this for my own birthday last night. My kids were expecting something spectacular (since it was my birthday), but I had no plan (since it was only *my* birthday). 🙂 Ended up making 12 mini bundts (plus an 8″ square) out of it, and tossed a couple frozen (slightly defrosted) raspberries plus a tiny drop of liquid stevia into the wells before frosting. Crushed a few sugar-free chocolate chips in with the peanut topping, too. Mmmmmm. Let me cut to the chase: Three out of three children begged me to make this for *their* birthdays, too!!! I am so making this recipe! Thank you for introducing a low-carb recipe with us. Beautiful and healthy, yum! When I was in high school (many, many years ago ?) I had a friends mom who made the best peanut butter cake, but she would never share the recipe. This cake brought bake all those memories! Peanut butter heaven!!! I’m can’t do dairy…I’m determined to try and make this dairy-free! Please let us know if it works with coconut milk or whatever you use dairy free b/c we can’t have dairy either and I want to make this for my family!!! Carolyn-do you know if coconut milk would most likely work? I know you haven’t made it with coconut milk but you are an expert and I think he would have an idea if it would work or not. You are so talented and your recipes always turn out for me. Thank you!!! Hi Carolyn, I just made this cake today, it was very good, I loved the frosting the best! lol I was wondering if I could use all coconut flour, no almond flour? And what is THM blend? Thank you for all of your hard work, we appreciate all of your wonderful recipes! PS. I sent you one of my recipes, FB messaging. it would be a very different recipe with all coconut and I don’t think I’d recommend it. THM blend is a flour blend for the Trim Healthy Mama diet. We just found out that my husband has type 1 diabetes about a month ago, and he was so upset that he couldn’t have sweets anymore. My mom actually recommended your website to me, and I was ecstatic to see you have this recipe! I just made it, and it is PHENOMENAL. I’m not a huge peanut butter person myself, either, but my hubby can’t stop snacking on this. So wonderful. That is so wonderful to hear, thanks! WOW! Made this yesterday and all I can say is I WILL be making this many more times!!! Nope, it’s really a full tablespoon. Low carb, gluten-free batters need more leavening to rise properly. Is the whey protein (or powdered egg whites) just for protein? Can I omit that? If so, do I need toadjust the flour amount? That’s a great idea. I’m doing that. This cake is superb! I opted to frost it with the chocolate frosting from your other sheet cake recipe, but after reading this reviews will have to try the peanut butter frosting next time. Thanks for all your great recipes. i made this, I loved it and accidentally ate too much. My only wish, is that it was a snack size cake, although you did say TEXAS sheet cake. Could you use a combination of peanut butter and peanut flour, I don’t have enough peanut butter but have peanut flour! Looks yummy and I want to make now! I just made the chocolate texas sheet cake to help celebrate with our 2 grandchildren the last day of school! Thanks for your great recipes!!!! How could I use peanut flour in this recipe? I have both almond and coconut flours, but am looking for ways to use my peanut flour. Thank you! Is it the darker, defatted peanut flour? If so, it would be a completely different recipe because it’s so extra absorbent. 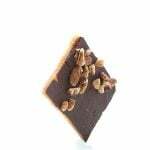 Have you tried my no bake peanut butter bars? That uses peanut flour. I would love to make this but I have everything except the almond milk. Is there something I can substitute ? Thanks! A mix of cream and water should be fine. Kite Hill has a really great low carb almond milk cream cheese that would work well here. Just made this for my 60th birthday tomorrow! 3 LCHF family members ( including me!) will be at the shindig . Does this need to be refrigerated ? We’re having a “destination ” party!!!! Yes, it should be refrigerated. Have fun! This recipe is AMAZING. My mom and I made this cake for my college graduation party, and it was the best cake we’d ever had! Thank you so much for this delicious recipe! Made this wonderful cake along with the Earthquake cake for the Fourth celebration. Our non-LC guests gobbled it up and asked for the recipe. Well done Carolyn! 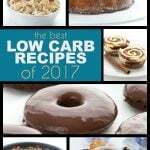 Oh thank you so much for this recipe, my husband is doing low carb and his favorite cake is a peanut butter cake. Now he can have his favorite cake on his birthday. I made your chocolate Texas sheet cake and it’s so good, I’m not even a low carb type of person, but this cake tastes just like the one my mom used to make my brothers and I when we were kids! I made this for my daughter’s birthday (per her request), and oh my goodness…it is absolutely divine. This frosting will be your mind. The only issue is, it’s difficult too stop at one piece. Thanks for this recipe. Oopsie… that’s blow your mind lol. Yes, just leave out the additional vanilla. My bf and I made this for my birthday and it turned out amazing!!!! We also added some chocolate drizzle to the top and it’s incredible! Thanks for this super easy and delicious recipe, Carolyn! I absolutely love your blog and all your recipes! 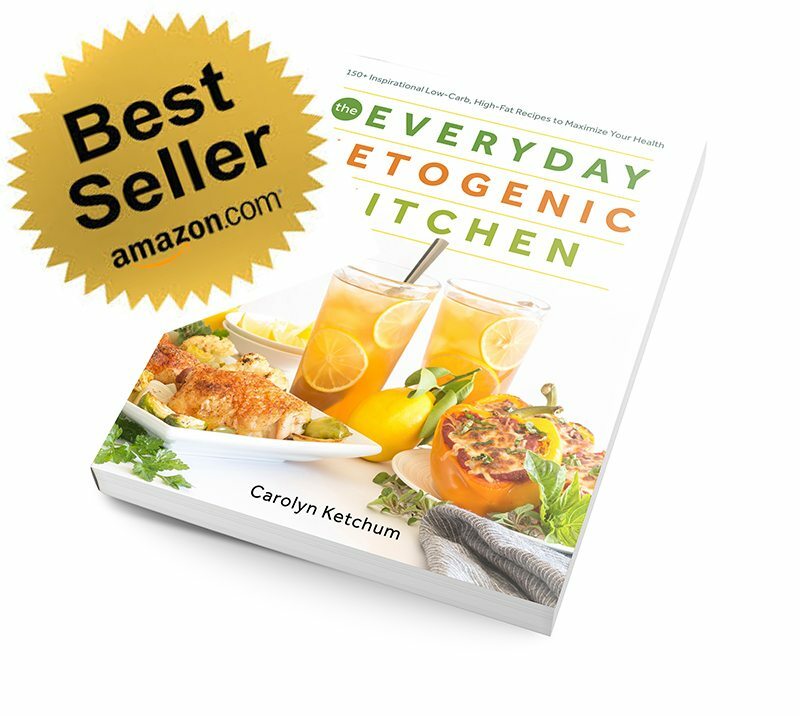 Anxiously awaiting your Everyday Ketogenic Kitchen cookbook to arrive tomorrow! Question about this on sheetcake recipe: do you think I could successfully substitute peanut butter powder for the 1/3 cup whey protein powder called for? I have PB Fit Organic powder…would make the carb count go up slightly, but seems like it would behave about the same as whey powder and also boost the pub flavor even more…what’s do you think? 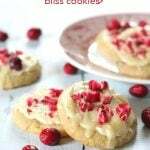 Hi Heidi, I don’t know how PB Fit works so I can’t say for sure but this is a pretty forgiving recipe. 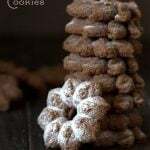 You may find that you need a bit more liquid if you add something like that because if it’s anything like peanut flour, it will be very absorbent. Wow, thanks auto correct for all those errors! 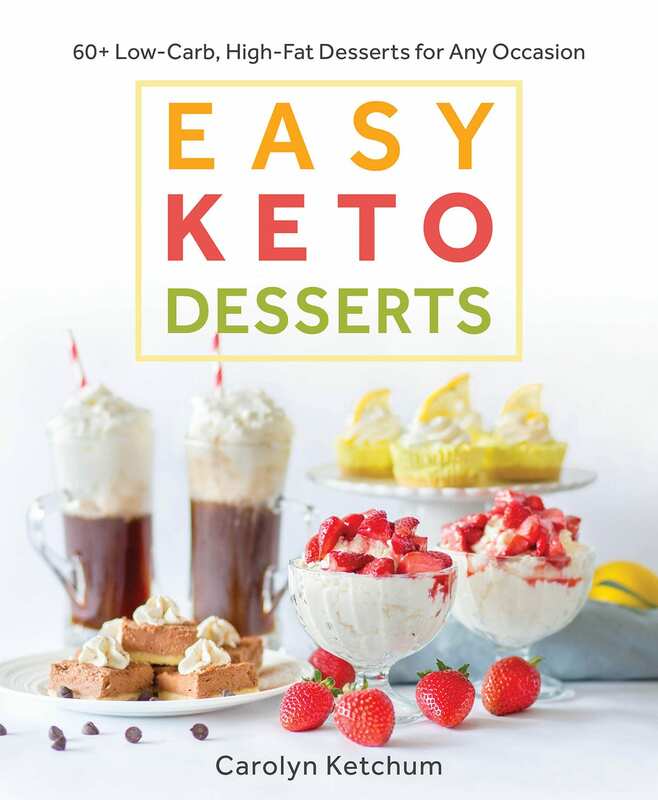 🙂 I have another question: if making this for a birthday party, which of your low carb ice cream recipes do you suggest to go with it? I’ve been wanting to try the pb fudge ripple…too much pb? (Is there such a thing?) Also, the biggest sheet pan I have is 10×15 ( standard cookie sheet). Will it work in there, or will it cook over the rim and make a mess? Thanks so much for all your help!!! I think your cookie sheet will work fine, this will rise a bit but it’s not super high. May take a little longer to cook through, though. Personally I would just do chocolate ice cream but if you want to do the fudge ripple, go right ahead! Do you think that I could substitute PB2 (peanut powder) for the whey protein? Not sure it would have the same affect but it’s worth a try. AWESOME!! I gotta tell you I have been wholey disappointed in low carb deserts especially baked goods. It was too far off the original, to artificially sweet typically that it wasn’t even worth it . THIS however was REVOLUTIONARY!!! Thank you for posting it on Instagram and making me enjoy a cake again without the carb guilt. My family is going to love this cake recipe! Is it still keto if I eat the whole pan?! LOL! So delicious!! My kids really loved this! Such an amazing treat! 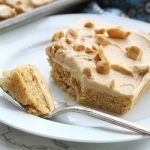 Sheet cakes are always a hit, but this peanut butter version was so tasty!!!! Amazing cake!!! I am from Texas and very accustomed to sheet cake!!! You did a fabulous job👍🏼I am making this one for the second time…..I have 7 children and they all love it!! Even those who have no idea its grain and sugar free enjoyed it😀Great work as always!!!! This cake is to die for! The frosting is so delicious! Thank you! This recipe is a DREAM! Sheet cake is the best!! I love making it for a crowd..it is always gone so fast! Love this peanut butter version! Can’t wait to make it for our next gathering! Best kind of sheet cake! This is awesome! This is really amazing! My kids can’t stop eating!